This level has easy difficulty. For this level try to play from bottom to shuffle candies and make special candy as you get the chance. 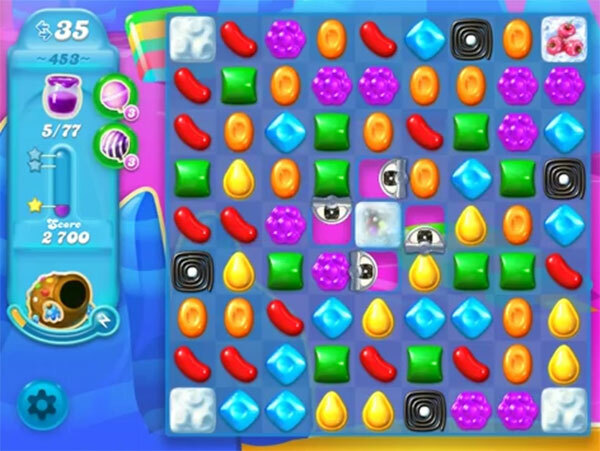 Combine special candies with each other to break the blockers and spread the jam. Try to play near to Jam candy to spread it to near candies. I hate this level it is too hard. I want to quit playing this game. No chance to win since King now limits how long you get to keep a booster. Ridiculous. I’m thinking of giving up along games altogether. I’ve been able to spread the jelly on 71 spaces, but not the final 6. I really hate levels that are so hard to conquer. The tips say that it is easy difficulty. Wrong, it is hard and I’m tired of playing hard levels. Can’t you have some really easy ones for a change. I agree with the people saying it’s too hard. Not fun when you are stuck on the same game for over a month!! We now have 30 and not 35 moves. Agree with above comments. Game is no fun at all!! This is definitely one of the stupidest levels I have ever seen. I love a challenge but this is ridiculous. How the heck do you get the candy from the middle? Been on this hard level over a month, getting bored now. Have completed super hard levelsquicke tf! !